Anybody who has an interest in premium and luxury goods certainly knows the name Dior. Founded for the first time back in 1946 by Christian Dior, the brand has always been associated with lavish top-of-the-class quality wears. While the company initially started and is still maintaining its traditions as a maker of haute-couture, Dior has also produced many jewelry and fragrance products for men and women. The fact that the company continues growing simply shows how much the consumers love the brand and the products. Now, if you are looking for a fragrance for men, you may have met Dior Fahrenheit. Dior Fahrenheit is a perfume designed and produced by the Dior house for masculine gentlemen. It is best described as a refreshing, woody, mossy, and warm fragrance. It will suit the men who want to appear gentle and confident, yet strong and virile at the same time. Dior Fahrenheit was first released in 1988, and, even until today, still remains very popular. This showcases how Dior Fahrenheit is a manifestation of that “old but gold” popular quote. Dior Fahrenheit is a classic fragrance that has endured the test of time. Just like what the name suggests, Dior Fahrenheit is quite a warm scent, and it is coming in a packaging that speaks the tantamount. Dior Fahrenheit comes in a dark red box, with the names Fahrenheit and Dior written in white. Inside, Dior Fahrenheit is sealed in a uniquely designed bottle that is actually pretty simple and straightforward. The bottle is also colored in a gradient of dark red, being darkest at the top but quickly transforms into light orange at the bottom. Such design is elegant and will certainly make good decoration on your personal dresser. As mentioned above, Dior Fahrenheit will suit a man who wants to appear gentle and confident without losing his masculinity. Therefore, Dior Fahrenheit can be an excellent wear for romantic purposes, such as if you are going on a date with your partner. Even so, it can also do well for professional purposes as long as you do not over-apply the fragrance over your body – just a few splashes, and you are good to go. This is especially because the silage and longevity of the fragrance are quite strong. With minimal applications, Dior Fahrenheit can already build your presence, so you need to be careful not to use it too much or you will smell intoxicating. In fact, some people have happened to dislike the perfume because of such over-application. Combine the strong silage with tons of sprays over your body, and you will become a nauseating smell of cut grass and leather. Dior Fahrenheit is also long-lasting. You will rarely need to re-apply the fragrance to get through the day. Dior Fahrenheit opens with a woody, slightly greenish opening. The notes of cedar can be immediately noticed along with the lavender and violet leaf notes. Citrusy scents of mandarin orange, bergamot, and lemon further support the top notes. The combination creates a gentle and confident impression. Dior Fahrenheit then develops its heart notes that mainly focus on the woody aspect of sandalwood and cedar. Finally, the base notes empower the whole scent with the warm leathery notes. The leather scent is strong and dominant, and is enhanced by amber and musk. 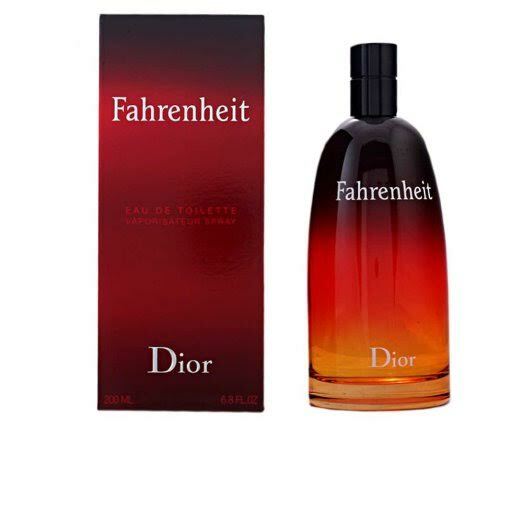 Check the best price for Dior Fahrenheit here!